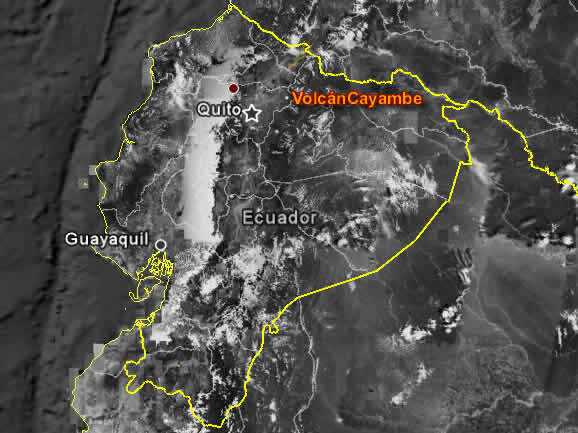 Cayambe is a volcano in the Cordillera Central of northern Ecuador. It is the third highest volcano in Ecuador Cotopaxi behind, has an altitude of about 5790 m above sea level. In the vicinity of the volcano, you can see its magnificence and also benefit from the volcanic soil fertility and the excellent water quality, since its surroundings present optimal conditions for agriculture, especially for growing roses in greenhouses. We depart from Quito, for the Panamericana North, through the Guayllabamba valley, known for its exotic fruit "custard apple" whose white pulp is refreshing, sweet and slightly acidic. We continue our journey towards Cayambe, where we turn on the path of Wimper, to the area known as the Z, where we can observe the Cayambe, Antisana and Cotopaxi volcanoes. Then we continue with approximately 1h15 walk up to the Refugio Oleas Ruales, located at 4600m m.s.n.m. During the trip you can see large grasslands, which move with the strong breeze, announcing that the snow is near. Arriving at the haven, snow is shown as a great white mantle, which impresses its visitantantes also observe the slopes that form the snow, the water reaches the river Pisque. After enjoying the beautiful scenery that offers the volcano Cayambe start our walk back. In the afternoon return to Quito. Warm clothes, sunscreen, sunglasses, camera, binoculars and good walking shoes.